Traditional watercolor paints may be transparent, semi-transparent, semi-opaque, or opaque. When painting with transparent paint, light penetrates the paint and reflects off the white paper. 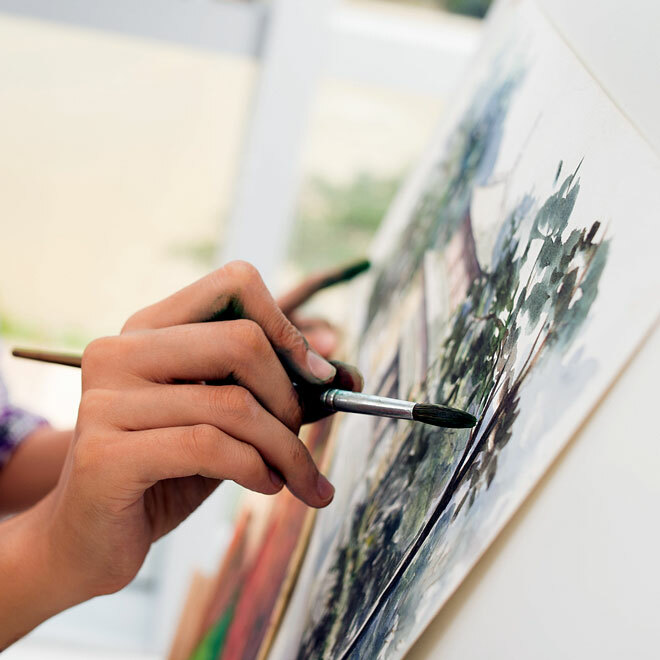 Watercolor paint has no noticeable thickness and dries by evaporation. The body that is seen on a watercolor painting usually comes from the roughness or smoothness of the paper. Transparent, or luminous, paints, such as cobalt blue, rose madder genuine, azo yellow, and viridian green, are often layered to produce different colors and effects. Opaque watercolor paints, such as cadmium and chromium paints, generally cannot be seen through, although they may be diluted with more water to make them less opaque. Some dense pigments, such as ultramarine blue and raw sienna, drop out of the water and sink into the roughness of the paper. These are called granulating or sedimentary pigments, and the paint appears more textured when dry. Other paints are permanent and stain the watercolor paper even after being washed off. However, an advantage of staining pigments is that they produce dark, rich colors that may show through later glazes. Some of these staining colors are phthalo green, phthalo blue, quinacridone rose, and permanent yellow. Da Vinci watercolor paints feature lightfast pigments approved by ASTM, making them one of the most permanent color paints available. M. Graham produces watercolor with exceptional amounts of pigment in a binding medium of pure gum arabic and natural blackberry honey. They say that the honey prevents the paint from drying out in the tube or on the palette. Available from selected online art stores. Mijello from Martin F. Weber Co. Premium watercolors. Experience Mission Gold Watercolors, handmade from carefully selected pigments and premium mediums. Maximum strength watercolors from Old Holland let the artist use very little paint to achieve bright colors. Rembrandt and Van Gogh paints are supplied by Royal Talens. Rembrandt is for the professional artist, while Van Gogh is for the hobby painter. Rembrandt is developed for maximum transparency, including a transparent white.